The true solution for pregnancy scanning in sows. 100% made in Europe! 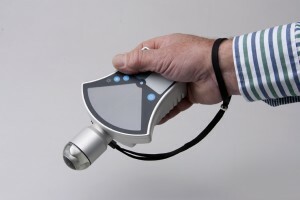 The Classic iNSight2 is a worthy successor of the Classic iNSight, the first “one-hand” scanner in the world. With numerous satisfied users around the world, the concept has proven itself and is even copied by our colleague manufacturers. It gives the breeder the possibility to check, without any fuss or worry, gestation in his own pig barn at his own time. The unit offers an easy and quick answer to the question whether or not a sow is in gestation. 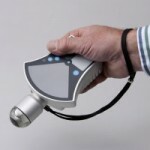 Ultrasound scanning has never been this simple before: without any preparation, the scanner can be taken into the barn and is instant functional on power on. This unit is specially designed for swine application and refined on the basis of the recommendations we received from users of our original Classic iNSight. Orientation is utterly simple since scan-plane and display are always lined-up. Images are easy to read and can show gestation as of 19 days post insemination. Whether in the group or in the box, the Classic iNSight2 is easy to use, without any cable that hinders free movement around the sows and no controls to worry about. There are only two controls on the unit, the on/off switch and two buttons to adjust the brightness of the display. That’s all, the rest is automated. No fancy or extra possibilities that will only confuse. The extreme hygienic conditions that apply in swine breeding are taken into account. The unit with its compact ‘all-built-in’ and flush design will not easily attract or attain pollution. 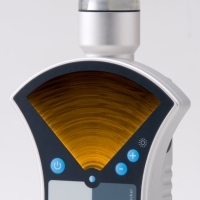 After use the unit can simply be cleaned under running tap-water or immersed in cleaning/disinfection fluid. One small integrated unit offers hours of scanning on just two rechargeable AA penlight batteries. Does a personal scanner pay off? There are many reasons to start scanning sows yourself. Hygienic reasons for example, but it can also be an economic consideration. To help you make the right decision, we created a simple spreadsheet. Fill in the fields to calculate the financial benefits of self scanning for your company, and how these benefits develop over time.